What is malaria and how (and where) exactly do you catch it? Can it be prevented and if so, how? This comprehensive guide to malaria includes everything from the most common malaria hot-spots, together with top tips on travel preparation and holiday health. What is malaria and where is it found on the malaria map? How many people are diagnosed with malaria every year? How do humans catch malaria? How does malaria manifest itself in the body? Who is most at risk of severe complications from malaria and where are they on the malaria map? How long after being bitten by an infected mosquito do malaria symptoms begin to show? Can malaria come back after initial infection? Is malaria contagious like cold or flu? Where are the malarial mosquito hot-spots on a malaria map? Does malaria peak at certain times of the year? What can I do to protect myself against malaria? Which insect repellent is most effective against the mosquitoes that carry malaria? What do Errol Flynn, Genghis Kahn, Lord Nelson, Christopher Columbus, JFK and Mother Theresa all have in common? How about Cheryl Cole, Sir Michael Caine and Sir David Attenborough? From US presidents and the Hollywood A-list, to TV presenters and pop stars the list of famous faces affected by this mosquito-borne disease is as long as it is varied. Yes you guessed it. Each and every one of the above has, at some point caught malaria. The name ‘malaria’ is derived from a translation of the Italian words for ‘bad air’ “mal'aria”. An infectious disease, which can quickly progress into a dangerous condition if not treated, malaria was first mentioned over 4,000 years ago when symptoms of the disease were found in ancient Chinese medical writings. Since then our understanding of how malaria is spread, where it is most likely to be transmitted (see this malaria map) , the side effects and steps we can take to protect ourselves have increased ten-fold. This serious disease can have severe consequences on health and even prove fatal to those without prompt access to proper treatment and medication. While malaria has been eliminated from developed countries with more temperate climates, it remains a huge health concern in many developing countries. It is also a concern for those heading to many tropical and subtropical parts of the world, particularly those travelling from non-malarial areas who may have low immunity to the disease. Malaria is a blood disease caused by a one-cell parasite called Plasmodium. This parasite commonly infects a certain type of mosquito from the Anopheles genus. There are five species of this malaria parasite that commonly infect humans. Use this table to search for malaria transmission rates by country. P. falciparum — found across the world both in tropical and subtropical areas. Globally, it is estimated that around 1 million people are killed by P. falciparum per year, especially in Africa where this species is prevalent. P. falciparum can cause severe malaria because it multiplies rapidly in the blood causing severe blood loss (anemia). P. vivax — this strain of the malaria parasite is most commonly found in Asia, Latin America and also in some parts of Africa. The P. vivax parasite is believed to be the most common human malaria parasite. This is mainly due to the population mass in these particular regions. P. ovale — most often found in West Africa and the islands of the western Pacific. P. malariae — prevalent worldwide, if untreated, P. malariae can cause a long-lasting, chronic infection that in some cases can be a life long condition. P. knowlesi — found throughout Southeast Asia and has a 24-hour replication cycle which means it can rapidly progress from an uncomplicated infection to a severe one. The World Health Organisation estimates that around 3.2 billion people - nearly half of the world's population - are at risk of malaria. In 2015, there were roughly 214 million cases, and of those it is estimated around 430,000 deaths from the disease. While more has become known about preventing and controlling outbreaks, resulting in a 60% reduction in deaths from malaria since the year 2000, sub-saharan Africa continues to experience a high proportion of malaria cases. In 2015, 89% of malaria cases and 91% of malaria deaths took place there. 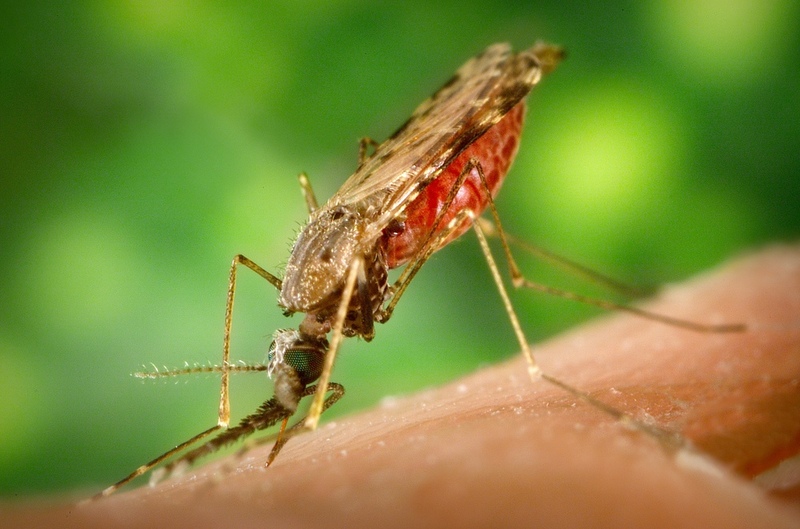 Malaria is transmitted to humans through a bite from an infected mosquito. Usually, this is the infective female Anopheles mosquito. The Anopheles mosquitoes can become infected while drawing blood from an infected person in order to nurture their eggs. When a mosquito bites an infected person, it draws a small amount of blood, which contains tiny malaria parasites. Then when the mosquito takes its next meal, the parasites mix with the saliva of the mosquito and can be injected into the next person being bitten. The parasite can be found in red blood cells of an infected person which means that there is a possibility of malaria also being transmitted through blood transfusions or organ transplants for example. Malaria may also be transmitted from a mother to her unborn infant before or during delivery which is known as congenital malaria. After the parasites have gained access to the host’s blood via a bite from an infected mosquito, they spend a little time exploring through the blood. This takes place over the course of just a few minutes. Before long the parasite begins to make its way to the liver cells. Once there, they begin to rapidly replicate. Over the course of the next seven days a single parasite can divide into 30,000 daughter parasites (known as merozoites). All the while, the person can feel quite well. After a period of approximately a week, the liver cell, which is now enlarged, bursts and the parasites are released into the bloodstream. Their survival depends on them being able to quickly find (and access) the red blood cells. If they can’t do this, the immune system can detect and attack the parasite. However, once inside the red blood cell the parasite is in a protected environment whereby it can begin to divide again. Around 48 hours later, the red blood cell bursts releasing more merozoites into the blood. And so the cycle repeats again. Before long and without treatment, the parasites can lead a path of destruction throughout the red blood cells in as little as two weeks. Initial symptoms of malaria may be mild and this can mean diagnosis is not always straightforward. Depending on the strain of malaria, an intermittent fever followed by feeling cold and shaking chills may occur in cycles. However, there are steps you can take to lower your risk of being bitten. Read how to choose an insect repellent that works and here's how to choose an insect repellent for babies and kids. Symptoms of malaria can appear up to seven days after you are bitten by an infected mosquito. The incubation period between being infected and the appearance of symptoms is commonly 7 to 18 days. This can vary depending on which of the specific parasites you are infected with. However, it has been known for symptoms to take up to 12 months or sometimes even longer to develop. If you suspect symptoms of malaria consult your healthcare practitioner for advice immediately, especially if you have recently travelled to a country where malaria is present. Even if you suffer from symptoms some time after returning from your trip, seek medical advice. Be sure to mention your travel location to them. Your healthcare provider will most likely perform a diagnostic test examining your blood under the microscope to see if malaria parasites are present. Malaria can be cured with prescription drugs. The type of drugs and length of treatment depend on the type of malaria, where the person was infected, their age, whether they are pregnant and how sick they are at the start of treatment. Certain strains of malaria such as P. vivax and P. ovale, can appear again resulting in a relapse of malaria symptoms. This is because the parasites have the capability to lie dormant in the liver. A recurrence can be anything from a few months, to a few years. Relapsing cases have even been known to recur up to four years after initial infection. The parasites effectively come out of hibernation and begin invading red blood cells resulting in the person feeling malarial symptoms once again. No, not necessarily. Malaria can be treated. If the right drugs are used, people who have malaria can be cured and all the malaria parasites can be cleared from their body. However, the disease can continue if it is not treated or if it is treated with the wrong drug. No, you cannot catch malaria from casual contact with an infected person such as sitting next to them, or shaking their hand. Malaria occurs in over 100 countries with tropical and subtropical climates. As this table shows, it is thought about half of the world’s population are at risk. This is because these warmer temperatures are ideal breeding grounds for the Anopheles mosquito. 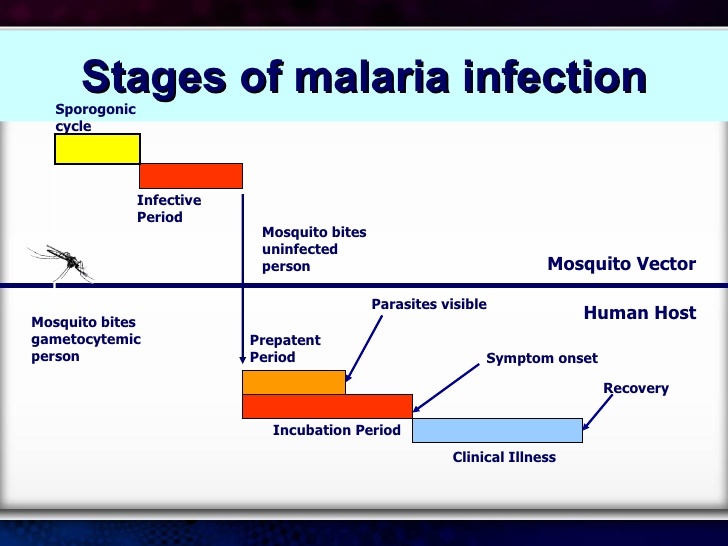 The malaria parasites also need warmth to complete their growth cycle before they are mature enough to be transmitted to humans. The Centers for Disease Control (CDC) also has a list of all the places in the world where malaria transmission occurs. There are around 340 different species of the Anopheles mosquito and only 30-40 of those are capable of transmitting malaria. Each of these species has it’s own breeding patterns and habitat preference. Transmission tends to be more frequent in locations where the mosquito lifespan is longer. One of the reasons for this is that it enables the parasite more time to complete its development inside the mosquito and evolve to a stage whereby it prefers to bite humans as opposed to animals. Immunity is a very important aspect, in particular with relation to adults in regions where malaria transmission occurs. In these cases it is possible for someone to develop partial immunity over the course of a number of years of exposure to the virus. Although this would not provide complete protection, it is thought to reduce the risk of malaria infection causing severe side effects. The World Health Organisation cites this as the reason that most deaths in Africa caused by malaria occur in young children who inevitably have low immunity. In areas where malaria transmission is less common, people have less immunity to the virus meaning that all age groups can be at risk. The environment plays a role in the transmission of malaria as the climate impacts on the breeding and survival of mosquitoes. Mosquitos thrive in wet and warm conditions. This is why peaks in transmission can occur seasonally, for example, during or just after wet, rainy seasons. When the climate is favourable, the mosquito population can boom. That combined with other favourable conditions, such as a host with low immunity entering a malaria risk area, can impact rates of malaria occurrence. Mosquitoes tend to be more active around dawn, dusk, and night however this can vary between species. Generally a mosquito’s internal body clock actually kicks in at these times telling them it's feeding time. At such times of the day, the atmosphere and wind speeds are calmer and temperatures are lower. All in all this provides ideal conditions for mosquitoes, encouraging them to head out to find something… or someone to bite and feed on. Mosquitoes also thrive in warm, damp conditions, as well as by areas of standing water such as lakes, pools, marshes and wetlands which offer perfect breeding conditions for them. They are also particularly fond of warm grassy areas to hide in. Whilst you cannot be vaccinated against malaria there are steps you can take to protect yourself before and on your travels. Familiarise yourself with malaria hotspots and always seek advice from a qualified travel health professional (Nathnac) or your GP who will be able to advise whether you need to take anti-malaria medication. Aim to do this at least four to six weeks before you travel. Invest in appropriate clothing, and insect repellent proven to protect against a wide range of biting insects, and mosquito nets if needed. Reapply if you are perspiring, at peak biting times and if you are swimming. Mosi-guard Natural® is a DEET-free repellent proven to repel the Anopheles mosquito, the primary vector of malaria in humans. It has been tested in both lab and field studies throughout the world against various Anopheles species. Although many experts maintain DEET or (N, N-Diethyl-meta-toluidine) is an effective repellent against mosquitoes in high-risk malaria areas, there are health concerns associated with its use, especially in young children. Due to its powerful solvent content, it is also known to damage plastics and clothing. A published study from the London School of Hygiene and Tropical Medicine has also suggested that certain mosquitoes are becoming de-sensitized to DEET repellents after initial exposure. For those seeking an effective natural alternative, Mosi-Guard NaturalⓇ is free from DEET. Instead it uses Eucalyptus citriodora oil hydrated, cyclized EC Oil (H/C) derived from lemon eucalyptus oil, nature’s most effective repellent. In trials repellents containing 30% Eucalyptus citriodora oil hydrated, cyclized EC Oil (H/C) derived from lemon eucalyptus oil, have demonstrated effective protection for up to 8 hours from a single application. With a fresh, clean scent, Mosi-guard NaturalⓇ is suitable for use on adults and children from the age of six months and can be used in high and low risk areas where malaria and other insect transmitted diseases are present. By taking a few simple precautions before and while you travel, malaria can be the last thing on your mind.